This is a section of Coventry city centre from before Trinity Street was built. Hand drawn based on old maps, so not accurate down to the last foot but provides a good impression of how it was. At the centre we have the famous much-missed Butcher Row, going downhill from the edge of Broadgate to its exits onto New Buildings and Ironmonger Row (note that this is the original Ironmonger Row not the currently named location at the top of Cross Cheaping). Next to Butcher Row we have the narrow pedestrian passage called Trinity Lane, which now has a higher surface and has been widened into a road in the present day. Butcher Row was demolished in 1936 to create Trinity Street, which was built over the flattened Butcher Row down to The Bull Ring then smashed through the end and carried on to where Sainsburys is as of 2015. 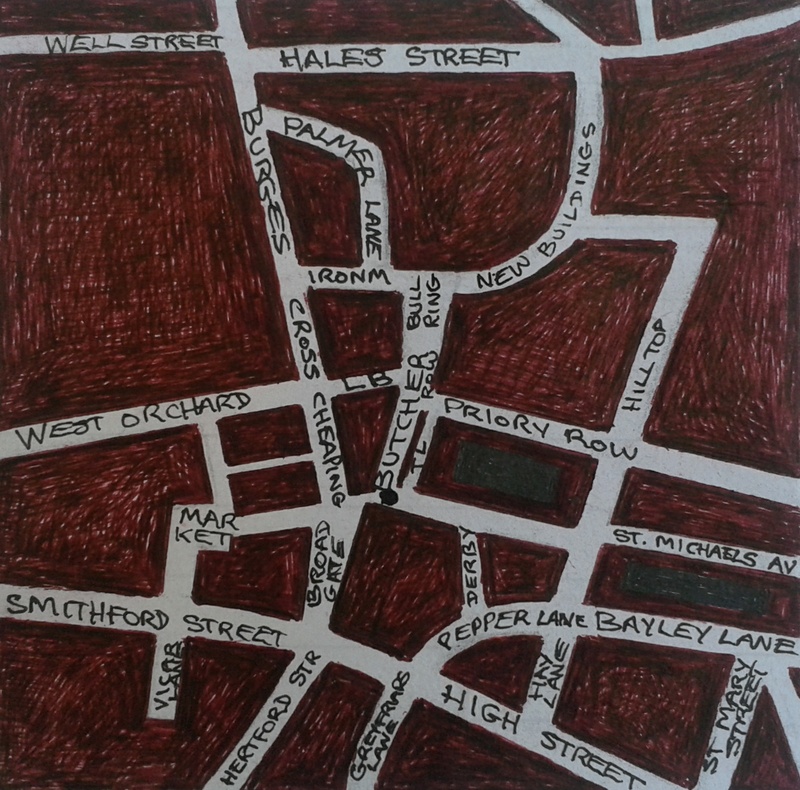 I should have drew Ironmonger Row slightly diagonally, maybe going up to the S of Burges on its left side.